In a small skillet over medium to low heat, melt some coconut oil (or cooking oil of your choice), and pour batter into the skillet into small silver dollar sized circles. Cook for 4 minutes on each side (be patient or it will fall apart!!). Serve with fresh fruit or agave syrup. Last night’s dinner is today’s … breakfast? Yep, you heard me right. Not leftovers for lunch or dinner, but leftovers for breakfast. 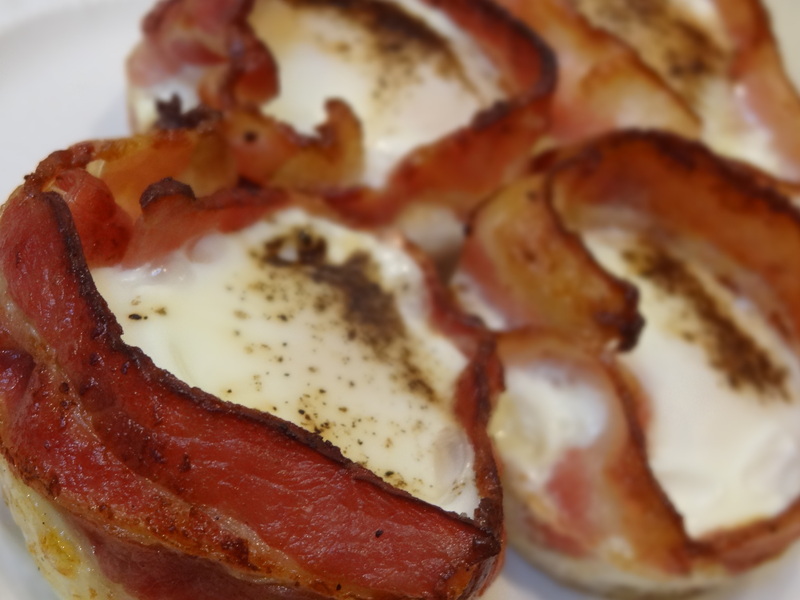 Typically, we think a big breakfast consists of eggs, bacon, sausage, toast, and butter. Oh, and a nice tall glass of O.J. Don’t get me wrong; I love those types of meals, but am a bigger fan of a healthy and protein filled breakfast. Please also put a hold on the high fructose corn syrup (24 grams of sugar in 8 oz of O.J.!!!!). 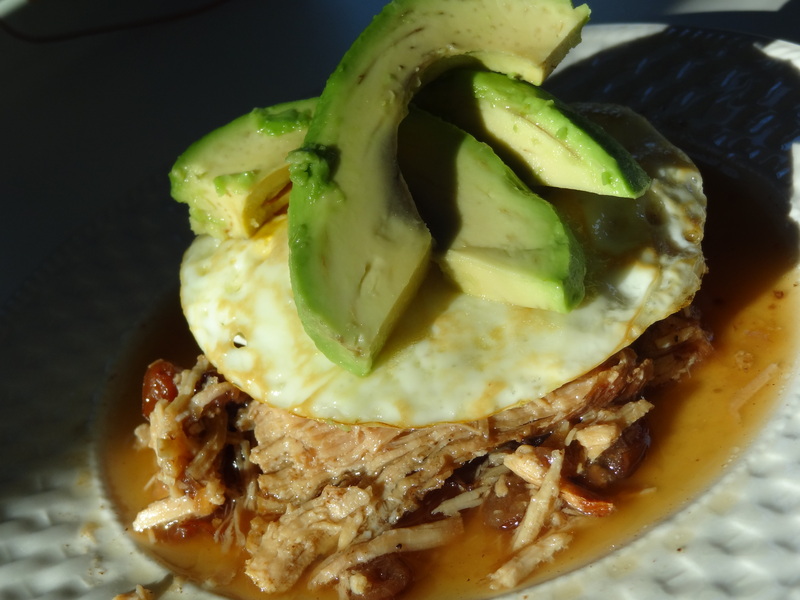 Today’s breakfast was last night’s crock pot dish. A day later, this crock pot dish is much tastier, juicier, more flavorful. After I cut up the pork last night, I placed it back in the sauce from the Crock Pot and it’s been sitting in there ever since, soaking up the fantastic flavors. Heated this baby up in the microwave, fried an egg, and topped with slices of buttery avocado. 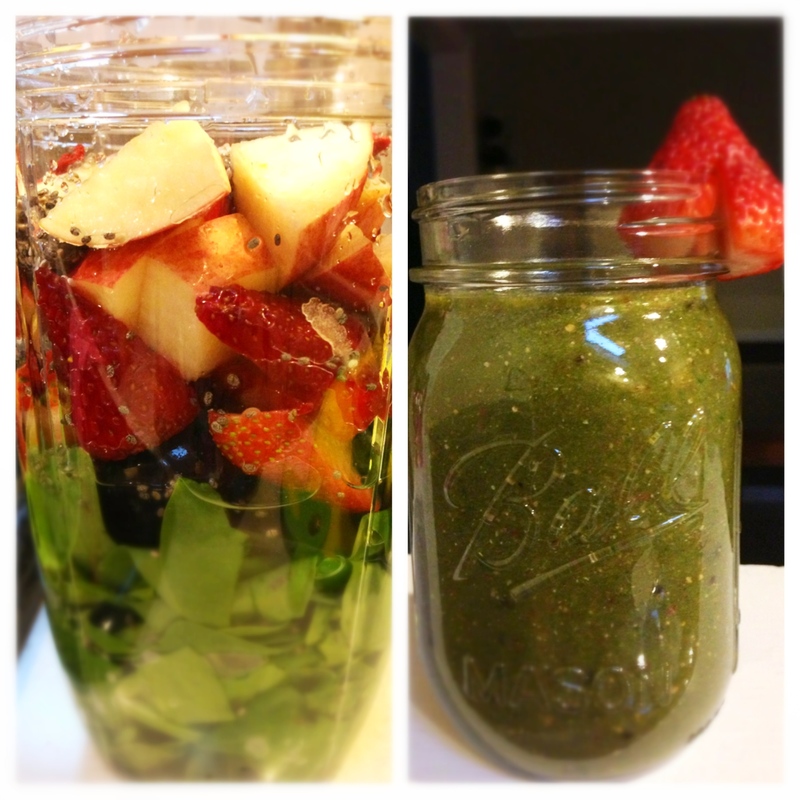 Had this with a cup of Jasmine tea and I’m ready to start my Sunday! 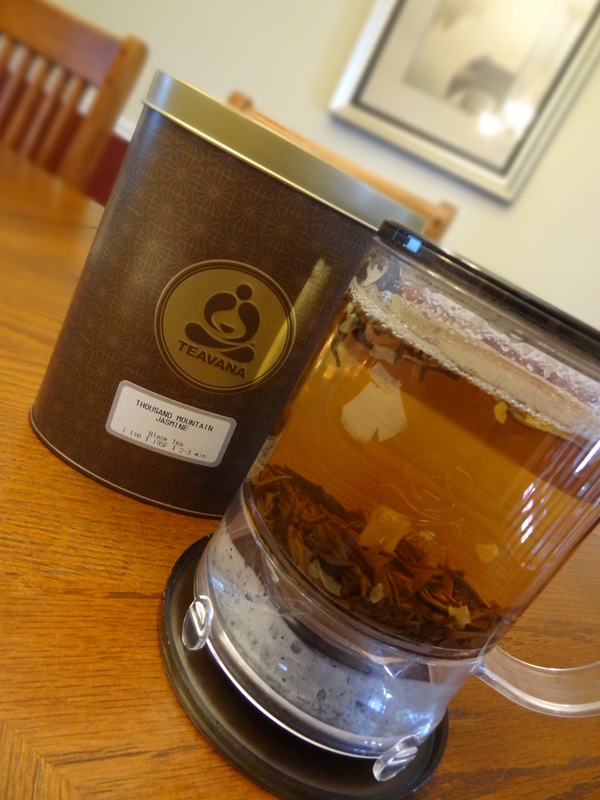 Photo below captures one of the best loose leaf teas from Teavana and my favorite – The Perfect TeaMaker! You place the leaves inside, add boiling water, and let steep for a few minutes. When done, place the apparatus on top of a mug and the tea will flow right into the mug! 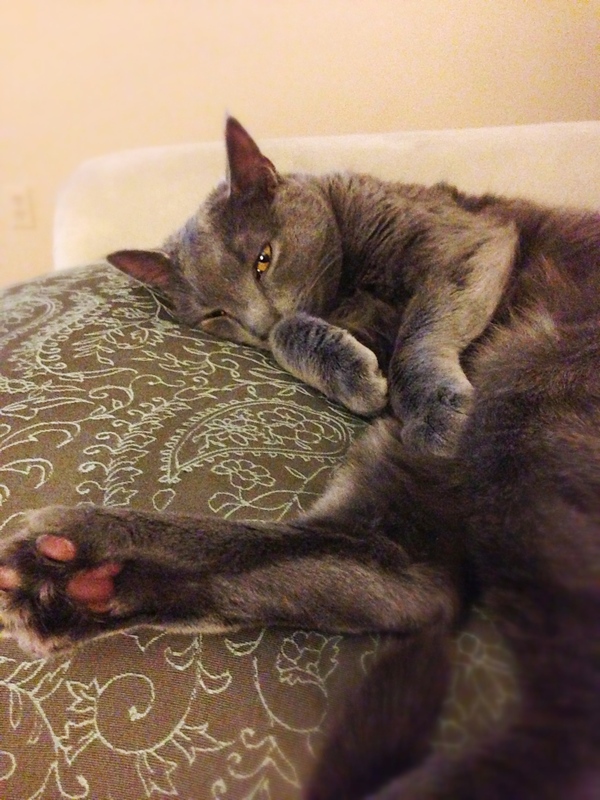 Weekend Brunch… Now where’s my mimosa? One of the main reasons as to why I started this blog was because I wanted to show people that it’s super easy and simple to cook fresh, healthy, and restaurant quality meals at home. 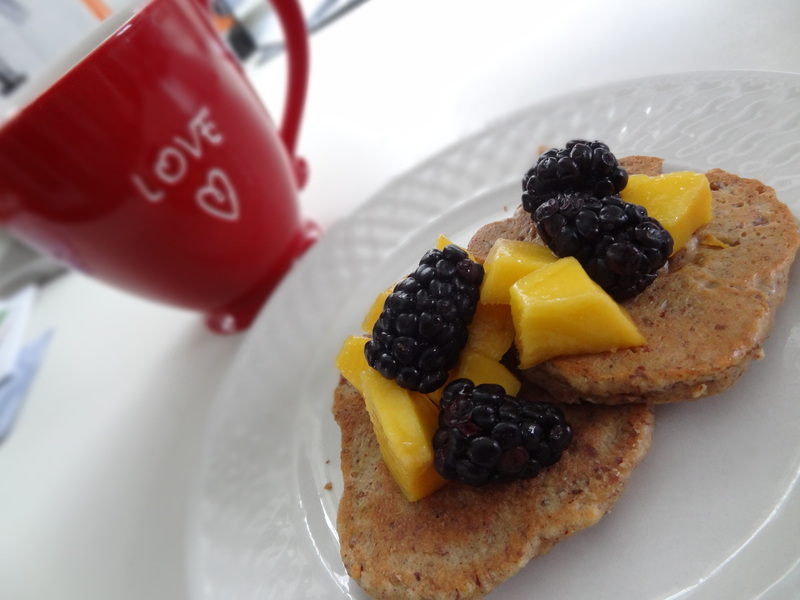 It’s definitely nice to go out to dinner once in awhile (hubby and I always try a new restaurant or visit a favorite at least once a week), but with some extra love and care in the kitchen at home, you can be your own little super chef of the household. I don’t need to explain my love for eggs. 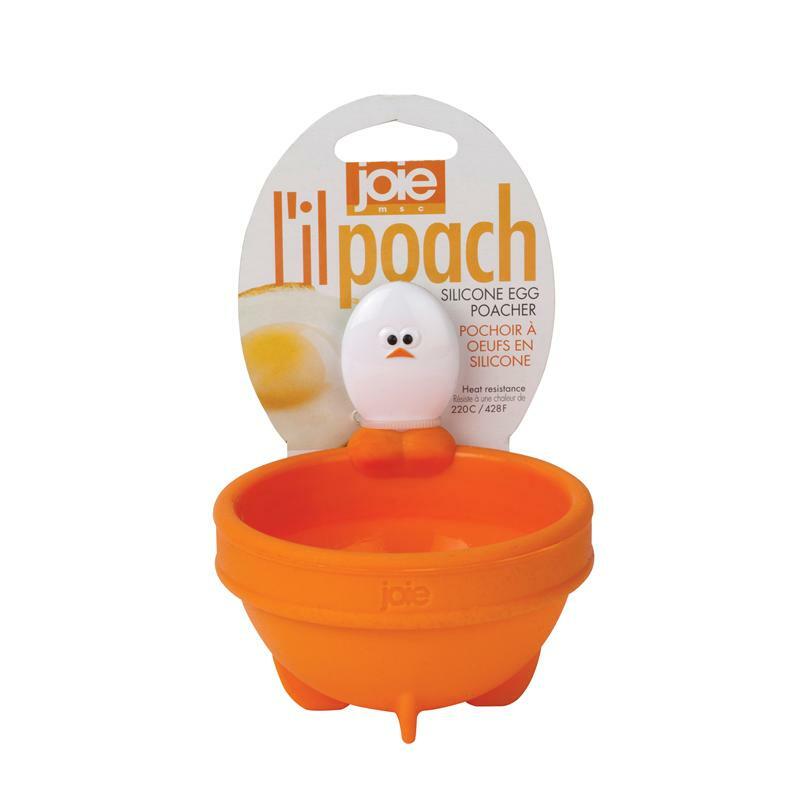 (If you are really interested, see my numerous posts which include the delicious egg: Over easy, medium, or hard?, Shakshuka me baby!, Deconstructed Omelet) I recently bought this egg gadget from Home Goods – it’s called the Lil Poach (HOW CUTE?!). It’s a silicone cup for poaching eggs. Thought I’d give it a try, though eventually, I’ll have to learn to poach an egg the “real” way, hehe. In a medium skillet over medium to high heat, place both asparagus stalks and drizzle with olive oil, sea salt, and black pepper. Grill evenly for about 5 minutes or until tender. Place the asparagus stalks on your plate and wrap with the smoked salmon. Poach your egg (using your Lil Poach) or the traditional way (I’ll share the instructions with you when I master this!). 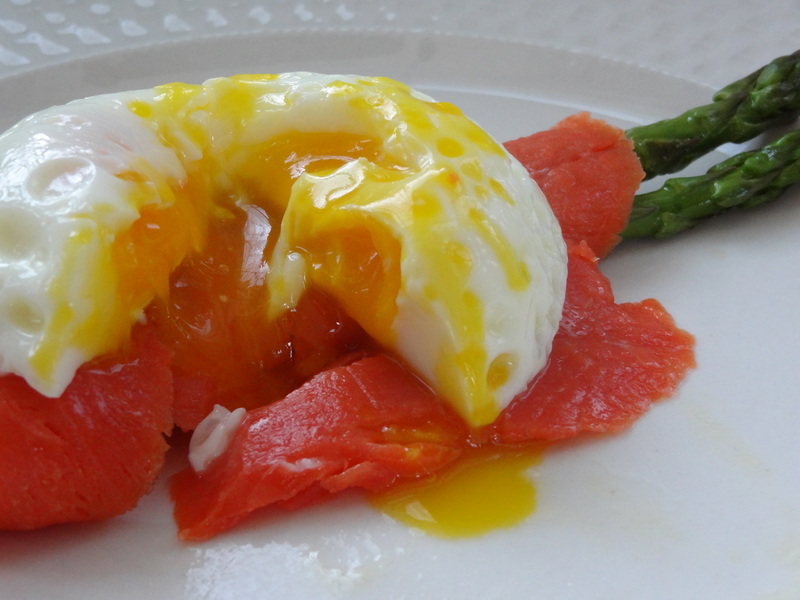 Top your smoked salmon wrapped asparagus stalks with the poached egg. Break the egg and watch the yolky goodness ooze all over the plate and EAT UP! Breakfast is my favorite meal. During the week, breakfast is always on the go – grab a protein bar, have some cereal, make instant oatmeal in a paper cup with the hot water from the coffee machine at work … A full and complete breakfast, with eggs, bacon, toast, & coffee (or a mimosa ;)) signifies the weekend to me; a time to decompress and relax from a long week of work. Watching too much Top Chef; which gave me the idea of a deconstructed omelet. They seem to always be deconstructing traditional dishes on that show. It never gets old. Too many clothes in my closet; which has made me start shopping for really fun (and perhaps useless) kitchen gadgets. I was shopping at Marshall’s the other day and came across this awesome gadget that makes your egg a perfect round circle when cooking! Haven’t we all experienced that issue before? You crack the egg into pan and then the egg whites just fly everywhere. You try to save it, get super frustrated because it won’t go back into the shape, and then realize it’s way too late and your fried egg is a hot mess. This “roundy egg ring” by Joie will solve all of those problems! Since I now had the opportunity to make a perfect round fried egg, I had to make the perfect round components to go along with it! In a small skillet over medium to high heat, cook your bacon until it becomes nice and crispy. 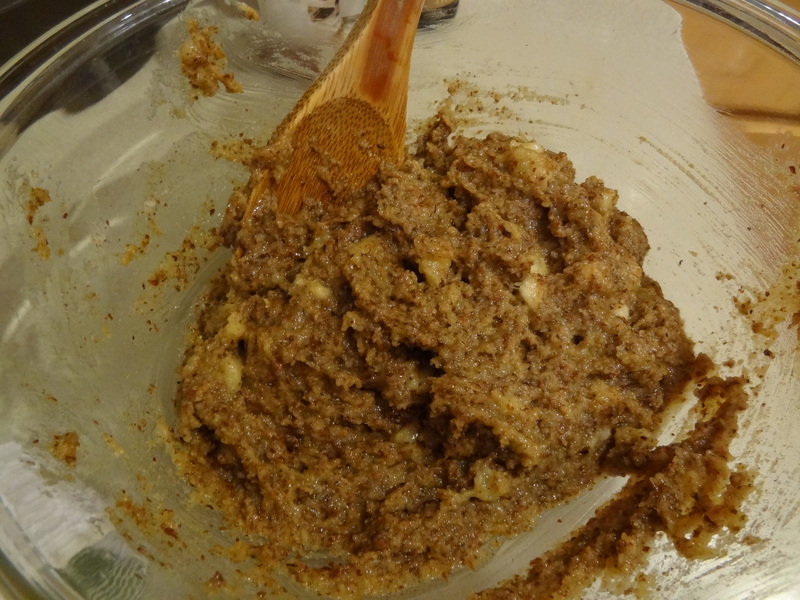 Using the bacon fat as your cooking oil, toss in onions, mushrooms, and sundried tomatoes. Saute for 5 minutes. Remove from heat. On low heat, fry your 2 eggs, using the awesome “roundy egg ring” tool. Layer your deconstructed omelet – Lay 1 piece of toast, then top of bacon hash, then with a fried egg, and repeat process until ingredients are used up. ENJOY with a nice cup of coffee to start your day off right! Honestly, how can you go wrong with any egg dish? If I could, I would eat eggs for every meal of the day… hard boiled, over easy, poached, scrambled… I love a good runny yolk. When I was younger, my favorite breakfast would be a scoop of white Jasmine rice, topped with 2 over easy eggs, and a few dashes of Maggi soy sauce. Dive right in, break the egg and watch the contrasting bright yellow yolk and dark black soy sauce merry with the pure white rice. This was seriously perfection. Place skillet (or preferably a cast iron skillet) over medium heat. Add olive oil and onions and sauté for a few minutes. Mix in the garlic and continue to cook until the onions become tender. Add the chopped red bell pepper to the skillet and mix well – for about 5 minutes. Add the chopped tomatoes, tomato paste, chili powder, paprika and cayenne pepper. Add a pinch of sea salt and black pepper. 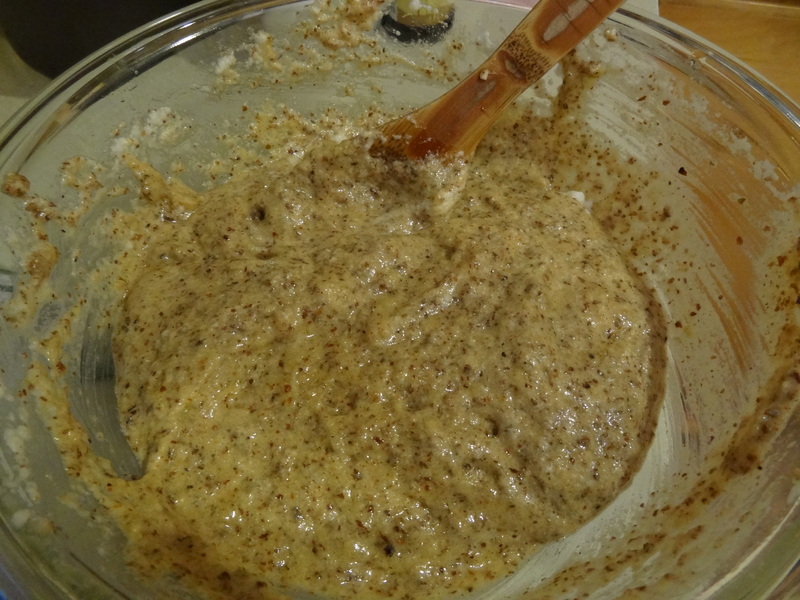 Lower the heat and allow the mixture to simmer for about 10 minutes. 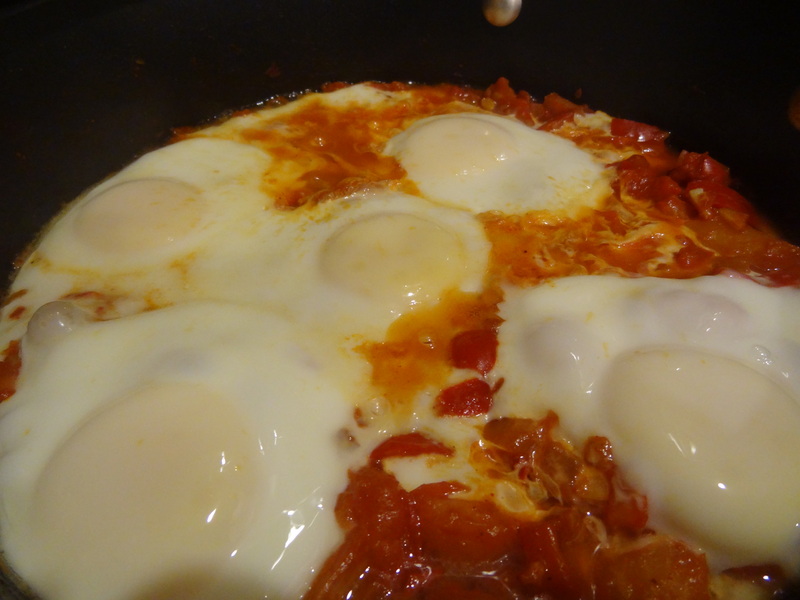 Crack the eggs into the skillet on top of the tomato mixture and make sure they are spaced evenly. Cover the skillet and cook for another 5 to 10 minutes. The eggs are ready when there is no more clear liquid. In today’s world, we’re always on the go. Wake up, get dressed for work, and you’re out the door and onto your next destination. We rarely have time for breakfast and the breakfast that we end up eating at our desks is often unhealthy. Instant oatmeal loaded with tons of sugar, cereal (also loaded with tons of sugar), or a breakfast bar (yes, you guessed it, which is loaded with tons of sugar). 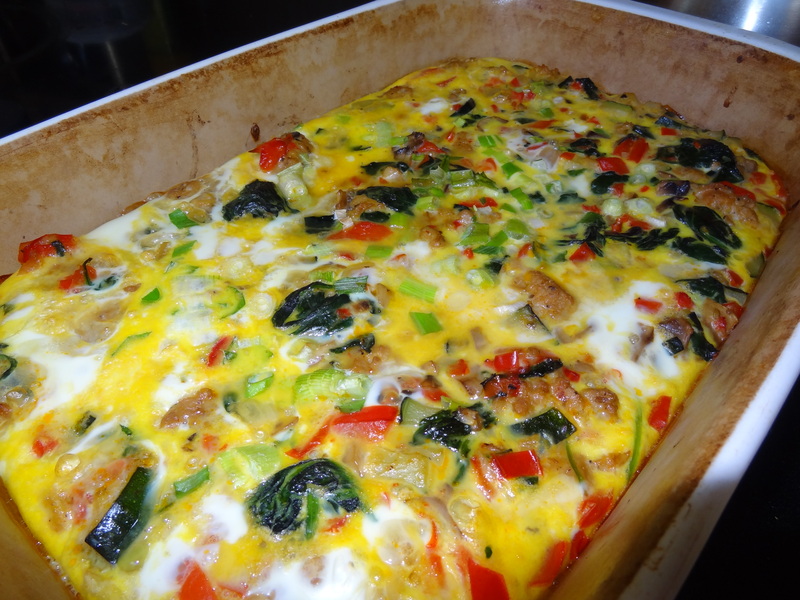 Spend 30-45 minutes on Sunday preparing this amazing breakfast dish and you will be set for the week and most likely into the weekend. 2. Place a frying pan on the stove top and turn on to medium-high. 3. Coat the pan in olive oil and throw in the onions and garlic. Saute until onions are translucent. 4. Throw in the chicken sausage first as this takes the longest to cook. As it is cooking, break the sausage up into small pieces. 5. Toss in the chopped zucchini and bell peppers. Add a pinch of sea salt and black pepper. Saute for approximately 5-7 minutes. 6. Throw in 3 large handfuls of spinach. It is important that this goes in last as spinach cooks very quickly. 7. Remove items from frying pan and lay into the baking pan. 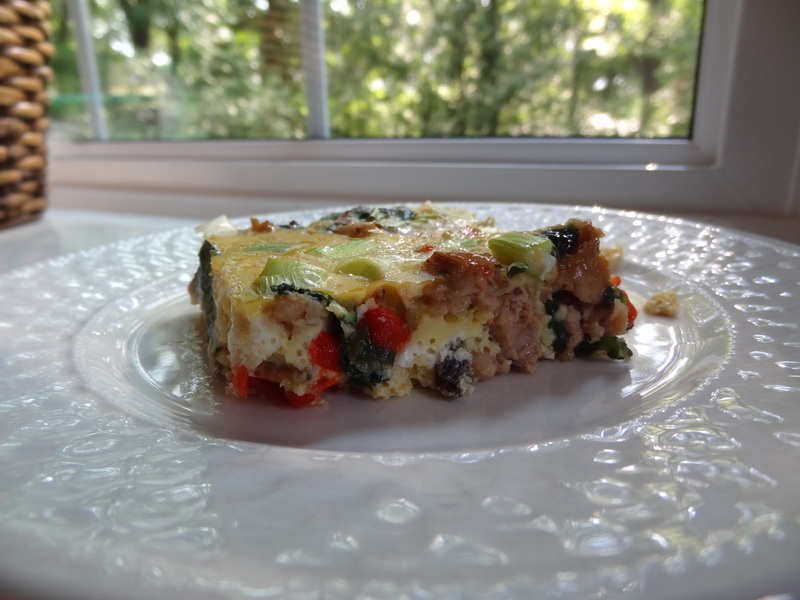 Pour the whisked eggs over the veggie/sausage mix. 8. 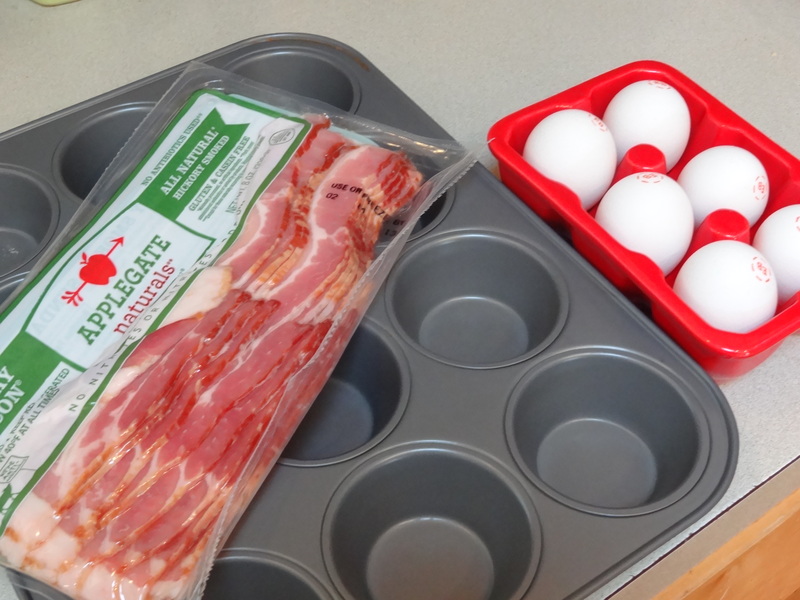 Place baking pan into oven and back for 25-30 minutes, or until the eggs are set. 9. 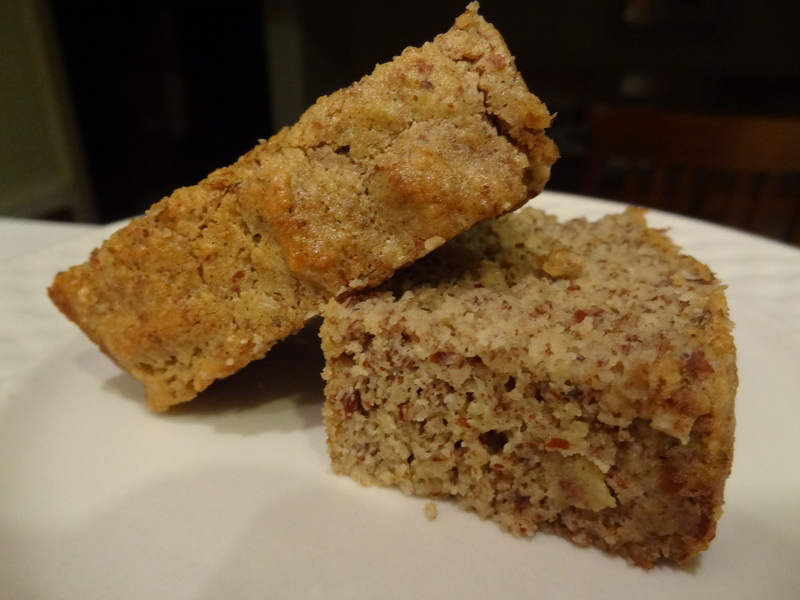 Cut into small squares and pack for breakfast on the go!